Invasive forest pests, including insects, diseases, plants, and animals can have a dramatic effect on the forest resources of North Carolina. A pest doesn't have to be non-native to be invasive, though a number of very important pests in North Carolina are from other regions of the world. An invasive pest can overcome a tree or forest's defenses and cause mortality because the ecosystem lacks the natural enemies of the pest's native range. Though there are many examples of invasive forest pests causing damage to trees in North Carolina, one of most significant pests over the last century, and one to which most others are compared, is the Chestnut blight (Cryphonectria parasitica). Monitoring potential invasive forest pests is a difficult task and one that must be taken seriously. Each year, traps are placed throughout the state in areas where the likelihood of pest introduction is deemed greatest. These traps are a good tool to help determine the presence or absence of a specific pest in an area. New pests can arrive in North Carolina in a number of ways, including through infested or infected nursery plants, wood packaging material, and even firewood. Our hope is that through public education and cooperative efforts with other agencies, we can help prevent the introduction or minimize the impact of non-native invasive species in our forests. There are many invasive forest pests currently threatening to move into North Carolina. As mentioned above, the movement of firewood is an important way that many non-native invasive species are being introduced to new areas. 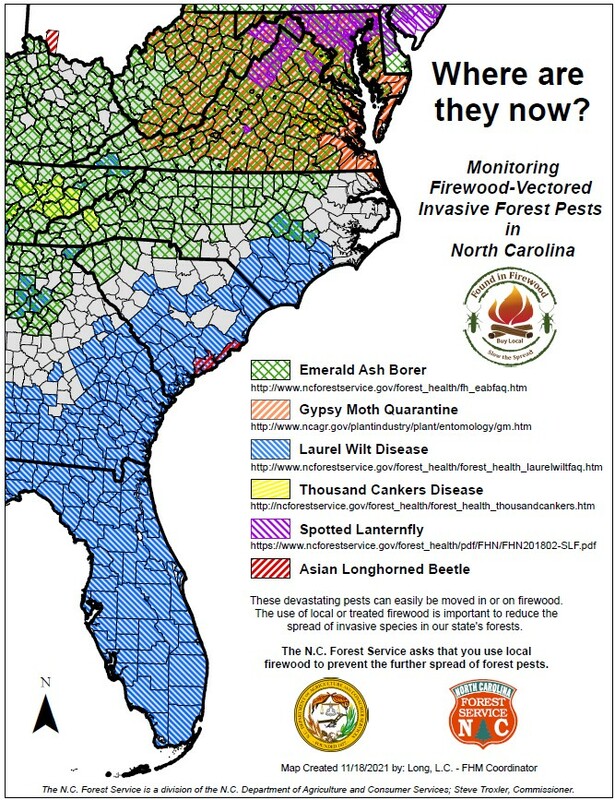 The pests on the map below are the closest major invasive forest insect and disease threats to North Carolina forests and are likely to be spread through the movement of infested firewood. Please help us keep these dangerous pests out of North Carolina by using local firewood whenever possible.